If you think you’ve eaten just about every seasonal treat that autumn has to offer, think again. One of the most delicious desserts that is perfect for fall time is apple cider doughnuts. 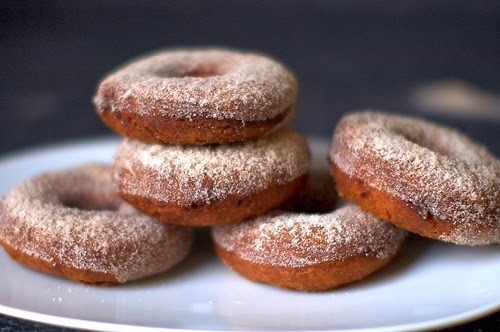 These cake-like doughnuts topped with a cinnamon-sugar glaze is a heavenly combination. Baking homemade doughnuts for any event is a creative and original idea; they’ll also be sure to be a crowd pleaser. Pay close attention to the directions because there are a lot of steps involved in the baking process. Don’t worry — once their scent comes wafting off the stovetop, you’ll be thanking yourself. 1. Core and coarsely chop the apples (do not peel). Combine with 1 1/2 cups cider in a medium saucepan over medium heat; cover and cook until softened, about 8 minutes. Uncover and continue cooking until the apples are tender and the cider is almost completely reduced, about 5 minutes. Puree with an immersion blender or in a food processor until smooth. Measure the sauce; you should have 1 cup. (Boil to reduce further, if necessary.) Let cool slightly. 2. Whisk the flour, baking powder, baking soda, 1 1/2 teaspoons cinnamon, salt and nutmeg in a medium bowl. 3. Beat 2/3 cup granulated sugar and the shortening in another bowl with a mixer on medium speed until sandy. Beat in the egg and yolk, then gradually mix in the applesauce, scraping the bowl. Beat in half of the flour mixture, then the buttermilk and vanilla and then the remaining flour mixture. Mix to make a sticky dough; do not overmix. 4. Scrape the dough onto a lightly floured sheet of parchment paper and pat into a 7-by-11-inch rectangle, about 1/2-inch thick. Cover with plastic wrap and refrigerate for at least 2 hours or overnight. 5. Meanwhile, make the glaze: Simmer the remaining 1 cup cider in a small saucepan over medium heat until reduced to 1/4 cup. Whisk in the confectioners’ sugar until smooth and glossy, then set aside. 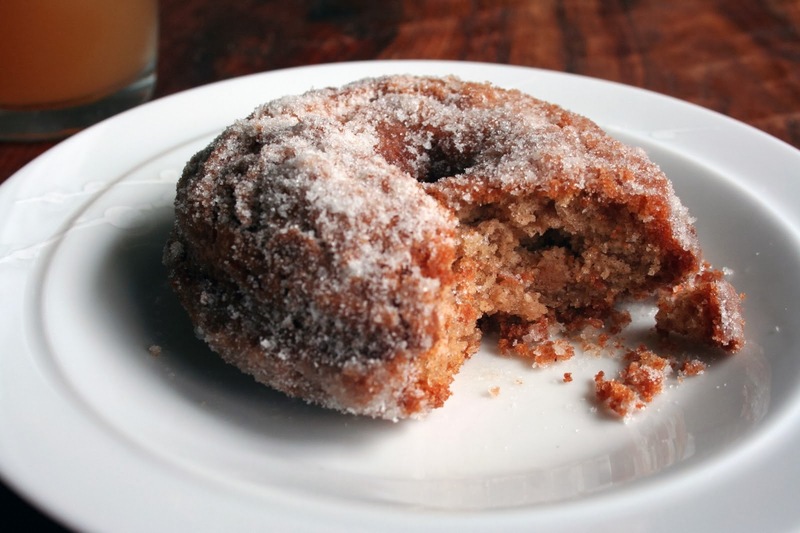 Mix the remaining 1 cup granulated sugar and 2 teaspoons cinnamon in a shallow bowl; set aside for the topping. 6. Heat 2 inches of vegetable oil in a large heavy-bottomed pot over medium-high heat until a deep-fry thermometer registers 350 degrees. Line a baking sheet with paper towels. Cut the chilled dough into 12 rounds, using a floured 2 1/2- or 3-inch biscuit cutter, then cut out the middles with a 1-inch cutter (or use a doughnut cutter). Slip 2 or 3 doughnuts at a time into the hot oil and fry until golden brown, 1 to 2 minutes per side, adjusting the heat as needed. Transfer to the paper towels to drain. 7. Dip one side of each doughnut in the cider glaze, letting the excess drip off; dip just the glazed side in the cinnamon-sugar or roll all over in cinnamon-sugar, if desired. Serve warm. Your friends will be begging you for more! Attending academy or academy is an big-ticket endeavor to say the least. Aback you bureau in the costs of tuition, textbooks, housing, transportation, lab fees, computer accessories and software, are aloof some of the costs that you will face anniversary year that you appear the academy or university of your choice. Although government aid in the anatomy of scholarships and grants is accessible to best students, there is still a advanced gap of unmet charge that is not absolutely covered by bald banking aid packages.